After Applying for GST Registration you will have an Application Reference Number (ARN). A GST Registration Application is processed after 15 days of application but you can check the GST registration status online on the GST Portal. 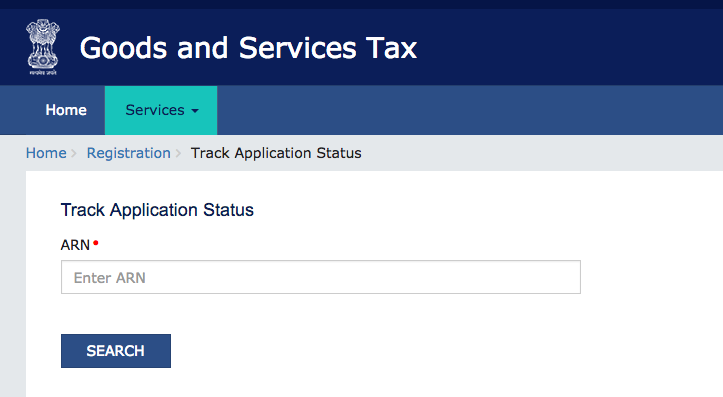 Step 2 – Go to ‘Services’ > ‘Registration’ > ‘Track Application Status’. Step 3 – Enter the ARN received by you on submitting GST Registration Application, Also enter the Captcha code and click on ‘SEARCH’. 1. Provisional – This means that application has not been filed yet but Provisional ID has been issued. 2. Pending for Verification – Application has been successfully filed but verification is yet to be completed. 3. Validation against Error – PAN details provided by you does not match with the details provided by IT Department. You need to resubmit the form. 4. Migrated – The application for migration to GST is successful. 5. Cancelled – Registration has been canceled. Check the status of your GST registration application online and take action based on the status of ARN.